Please click on the links below to see more information about Stokes Bay. There are three large public car parks and two smaller ones, all Pay and Display. At the west end of the Bay is No.2 Battery West. There are two smaller Pay and Display car parks, Alverbank East and Alverbank West car parks. GAFIRS is an independent Inshore Rescue Service that was founded in 1969. The service provides free marine rescue cover in the Solent, from Portsmouth Harbour to Titchfield Haven. The crews are on call with HM Coastguard 24 hours a day, 365 days a year. 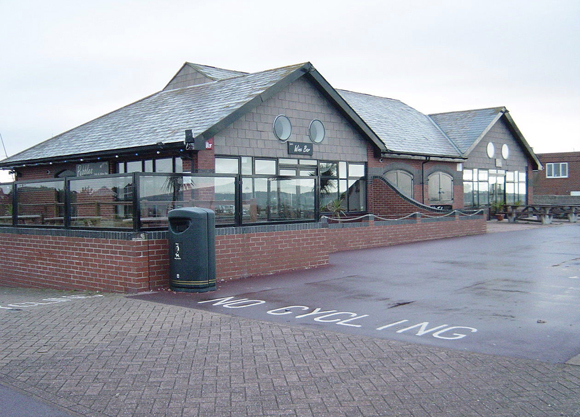 Their purpose built Lifeboat Station and Headquarters is at the Eastern end of the promenade. 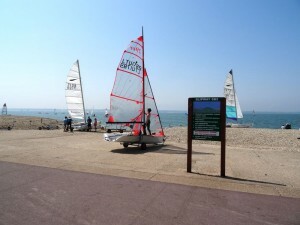 A friendly club offering sailing facilities for all. 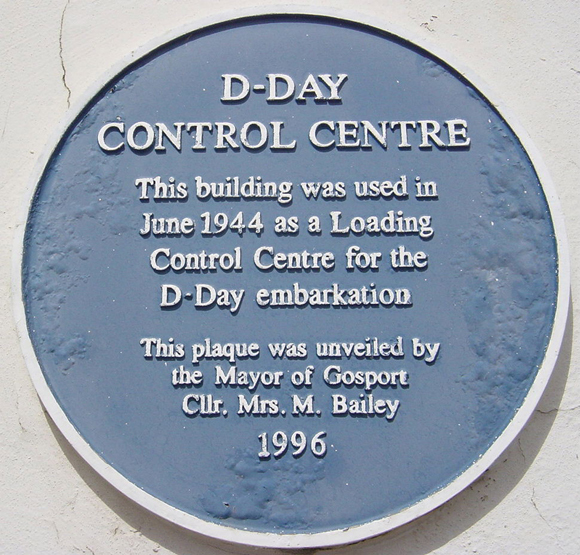 Their building was built as the D-Day Command Centre and it played an important part in the D-Day embarkations as stated on the blue plaque. 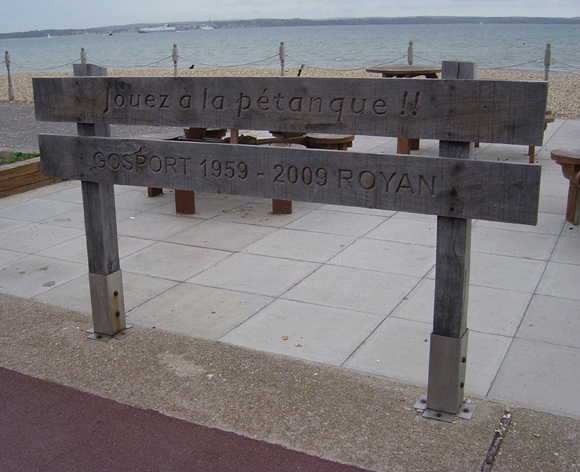 Gosport is twinned with Royan in France and to commemorate the 50th anniversary two pétanque pitches were laid. You will find them on the seaward side of the promenade next to Pebble Beach Cafe. The fower beds ar now maintained by volunteers from The Friends of Stokes Bay. No2 Battery was part of the Stokes Bay Lines which were built to defend the naval dockyard in Portsmouth Harbour from a possible French invasion. 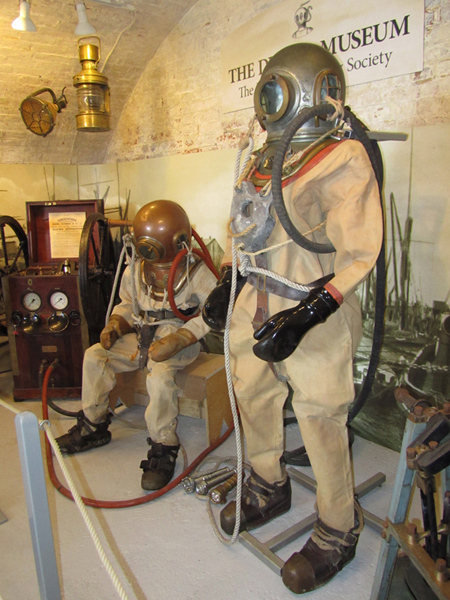 It now houses the Historical Diving Society’s diving museum which opened to the public on 30th April 2011. Summer (March-October) 10a.m. – 7p.m. Winter (October-March) 10a.m. – 4p.m. 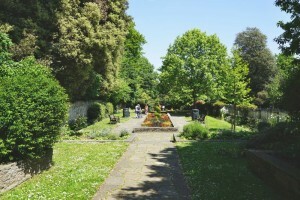 Water features operate in summer only (weather permitting) and may be switched off for short periods during opening hours whilst regular water quality treatment works are undertaken. 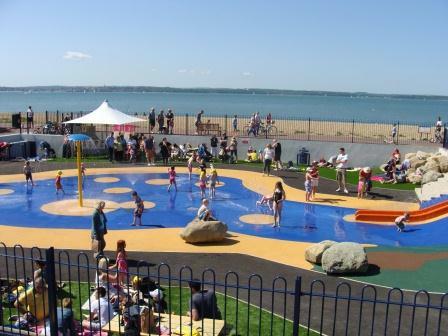 Gosport Splash Park has been designed and provided by Gosport Borough Council as a free outside play facility with traditional all year round play equipment and water features which are open in the Summer only. 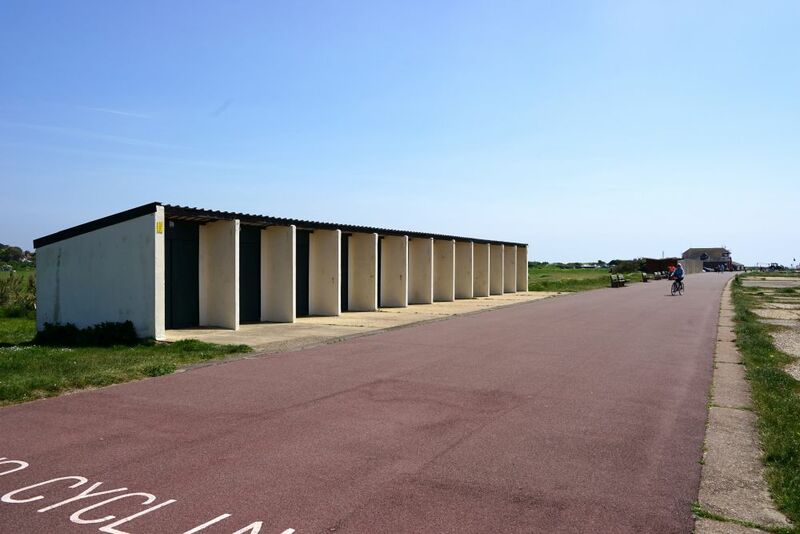 Located on the sea front at Stokes Bay there are public pay and display car parks adjacent and nearby public toilet facilities within approx. 128 metres. Formed in 1885, this is a 9 hole links course, with 18 tees, to test all abilities. 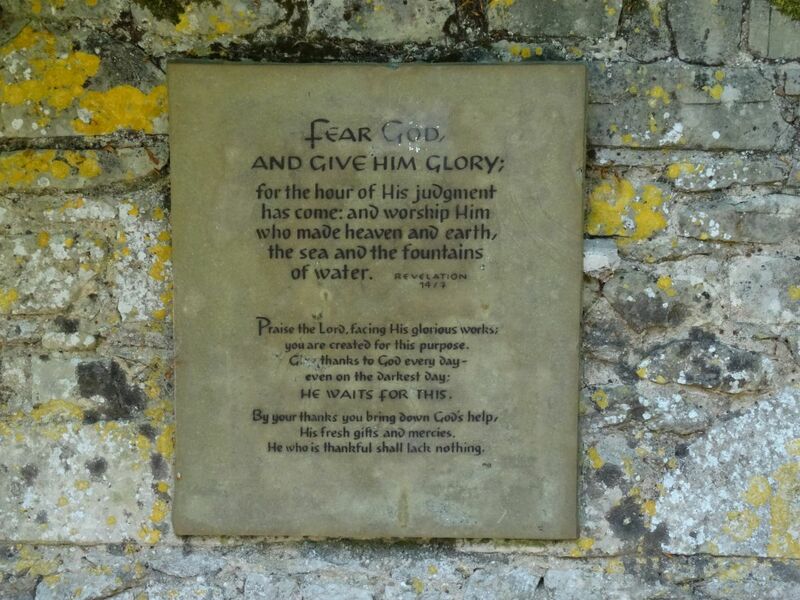 You will find it at the Gilkicker end of the Bay. 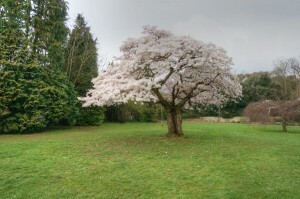 The greens are either side of Gilkicker Lake. 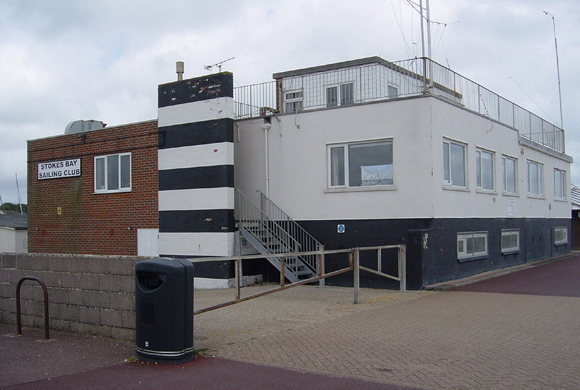 The club HQ is next to the Mason Boys Tower in Fort Road. The course offers unrivalled panoramic views of the Solent and the Isle of Wight and it was on this course that the term “bogey” originated. Solent Adventure Golf Ltd have a crazy gold course at the centre of the Bay, north of the Pebble Beach car park. 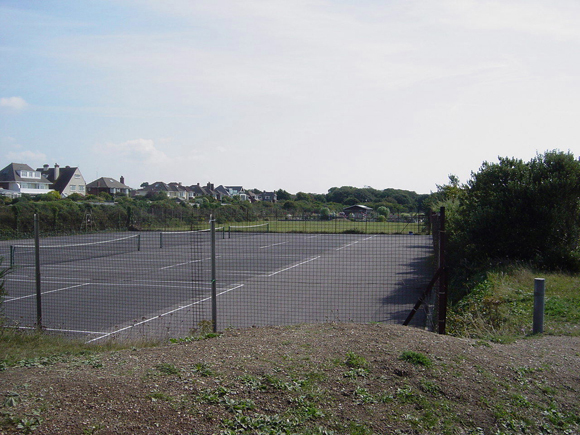 The tennis courts are also operated by Solent Adventure Golf Limited and can be used by obtaining a ticket from the Crazy Golf office. Fees are £5 per court per hour. Tennis equipment is available for hire from the golf reception. Access to the courts can be available 24/7. 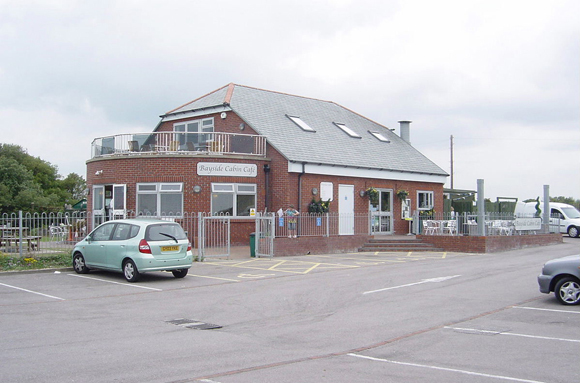 Pebble Beach Cafe and Bistro is situated at the centre of the Bay. At the east end is Bayside Cabin. Some refreshments can also be obtained at the Crazy Golf offices. 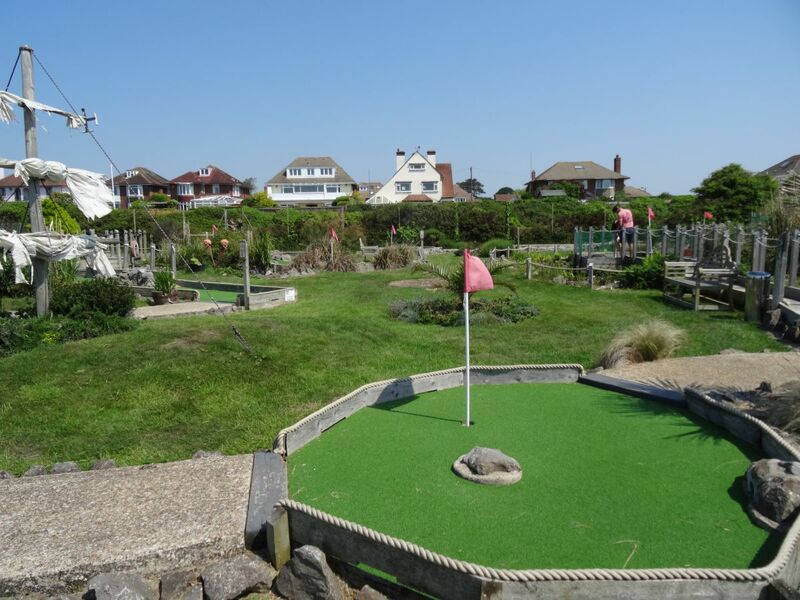 One at the west end near to the Diving Museum, another close to the children’s play area and splash pool and a third at the Gilkicker end on the field used by kite Ffiers. 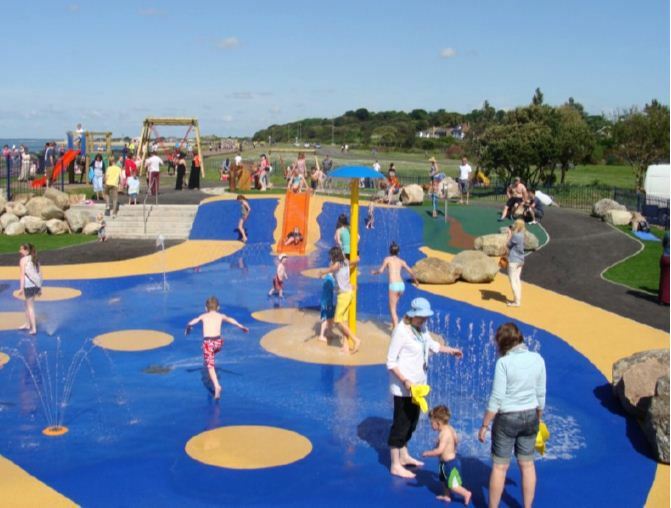 In April 2013 Stokes Bay was voted one of the top picnic areas in the UK. The beach is manually cleaned throughout the summer months. There are litter bins on the beach (dog bins available off season). in the centre of the Bay on the promenade next to the Stokes Bay Sailing Club and Pebble Beach Cafe. Summer Species: Bass, rays, sole, smoothhounds, mackerel and bream. Winter Species: Whiting, pouting, codling, and flatties. Sometimes dab. Occasionally Conger Eel. Summer Species: Bass, mackerel, smoothhounds, rays, dogfish, bream, plaice, and sole. Winter Species: Whiting, codling, rockling and flatties. 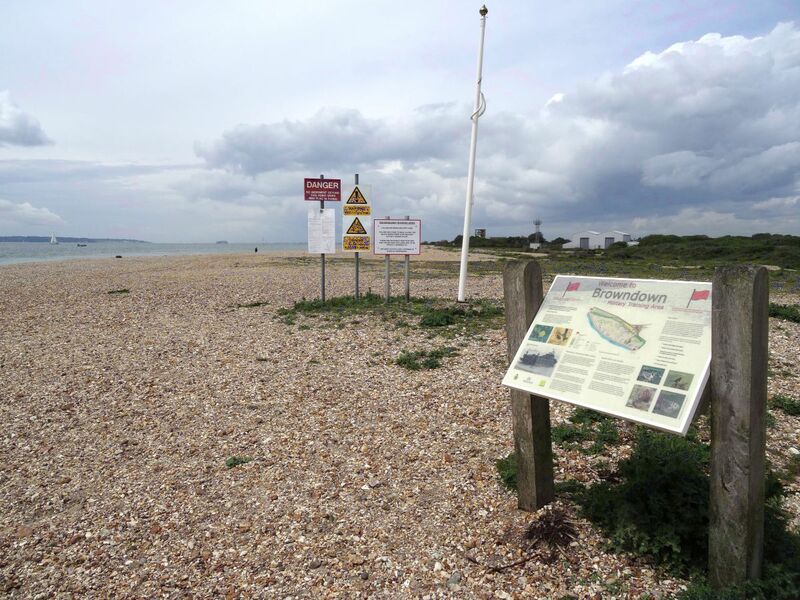 Visit the Fishing Guide for Stokes Bay for an up-to-date list. Gosport Borough Council have prepared a month by month guide to fishing in Gosport. The club was formed in 1949 with the club house and boat yard located close to the shore line at the Gilkicker end of the Bay. Stokes Bay received a Water Quality classification of ‘Excellent’ with three stars in 2015 the highest classification meaning the water is cleanest. 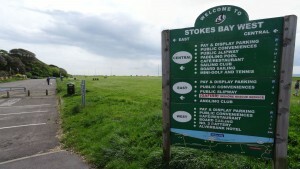 Stokes Bay: Good Beach Guide. 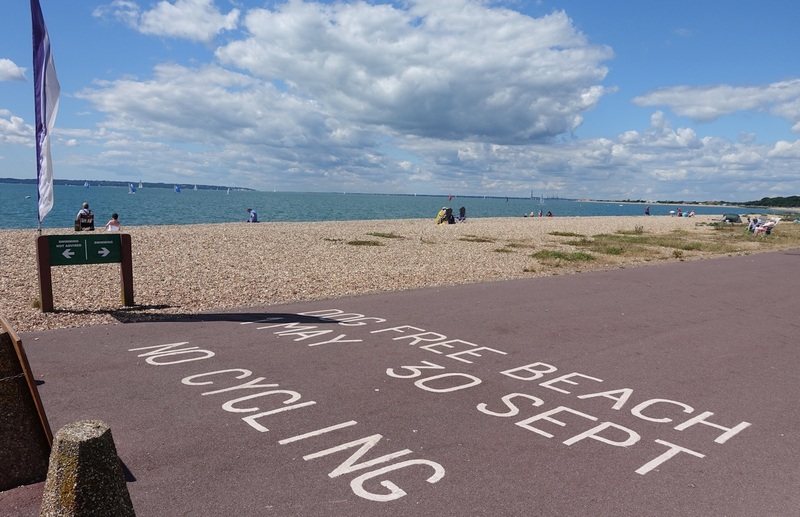 There are three warnings for Stokes Bay beach due to Strong winds, tidal cut-off and a deep shelving beach. Swimmers are advised to stay between signs that show the safe areas for swimming. 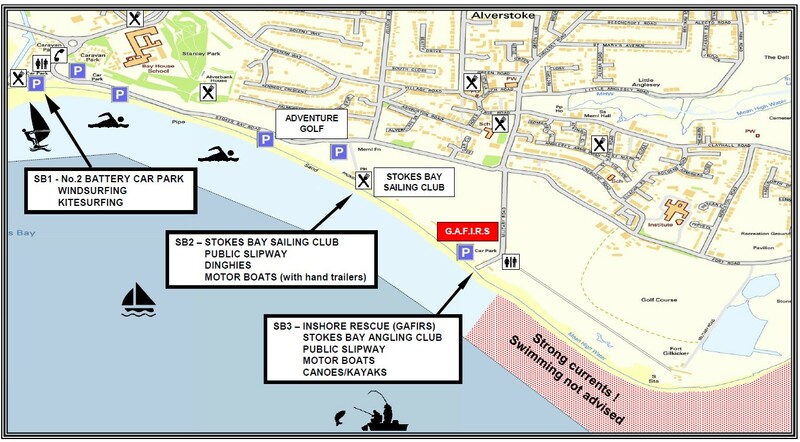 There are no beach life guards on duty at Stokes Bay but GAFIRS have a lifeboat station at the east end of the beach. 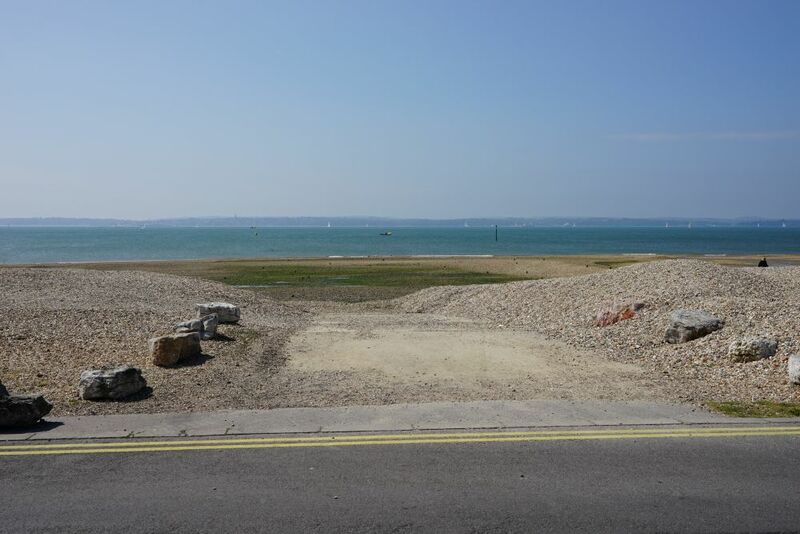 Stokes Bay has two maintained slipways for public use with a third at the western end of the Bay. This is a public slipway but it is often hidden with shingle. This is a public slipway adjacent to Stokes Bay Sailing Club. For: Dinghies, Motor Boats with hand trailers. The West side is reserved for G.A.F.I.R.S Inshore Rescue. Please respect and leave this clear for emergency use at all times. The East side is for public use. For: Motor Boats, Canoes and Kayaks. 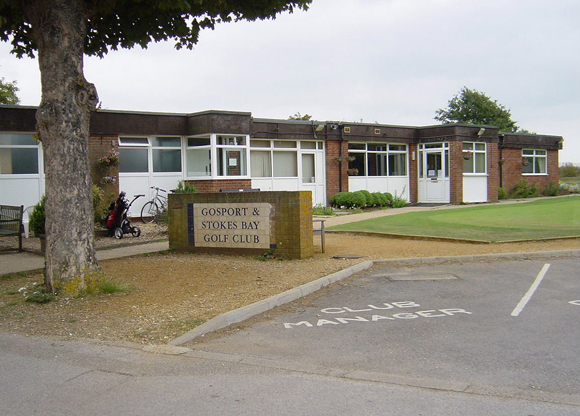 Slipway SB2 at the Stokes Bay Golf Club H.Q. The Bay is zoned for water sports. and those wishing to use them are advised to go to Lee on the Solent for launching, which is the designated site. 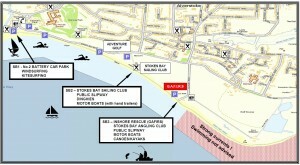 Download a Water Activity Leaflet at Stokes Bay, including a map. 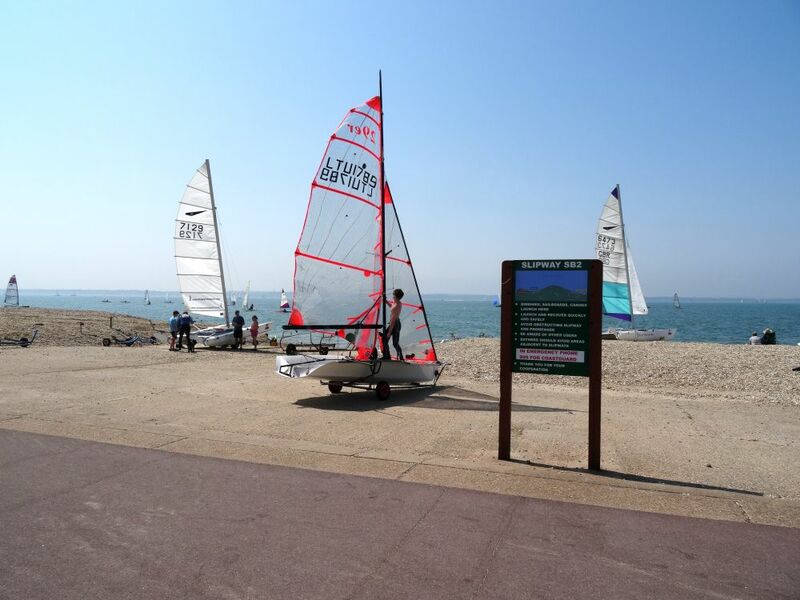 Stokes Bay is :Probably the safest place to sail on this stretch of coast and suitable for beginners. The ideal wind direction for Stoke Bay are SW and SE which produce the cleanest wind but can also be sailed in anything from E to WNW. The tidal range is small, the most furthest you have to walk to the water is 10 metres and launching is easy even in very strong winds. It’s a very good place to practice short board technique. In an E just about every windsurfer in the area sails here as the wind funnels between the Isle of Wight and the mainland. 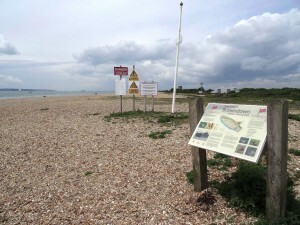 A speed limit of 10 knots is applicable within half a mile of the Solent shoreline at Stokes Bay and Lee-on-the-Solent. 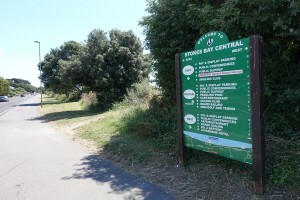 A shared cycle path runs alongside the Stokes Bay Road from the east end of the Bay to the west end. Cyclists are advised to use this cycle path in preference to cycling on the Stokes Bay Road, which can be very busy in Summer months. Cycling is not permitted along the promenade itself. From Stokes Bay you can cycle west to Lee on the Solent – a traditional seaside town offering clean safe bathing, grassy cliff tops, a long promenade and a shopping centre with shops, cafés and restaurants. 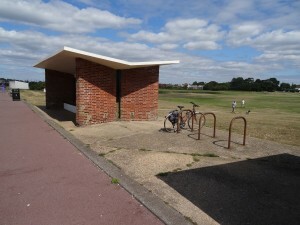 Bike Rack at the east end of the promenade hidden between the shelter and the beach huts. There are three sets of cycle racks along the promenade with three cycle hoops at each point for securing your cycle while you visit. 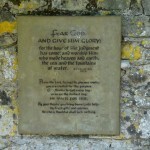 The first is at the extreme west end of the promenade close to the slip road to the No.2 Battery car park. The second is next to the children’s play park and the third is between the shelter and the beach huts at the east end of the promenade. 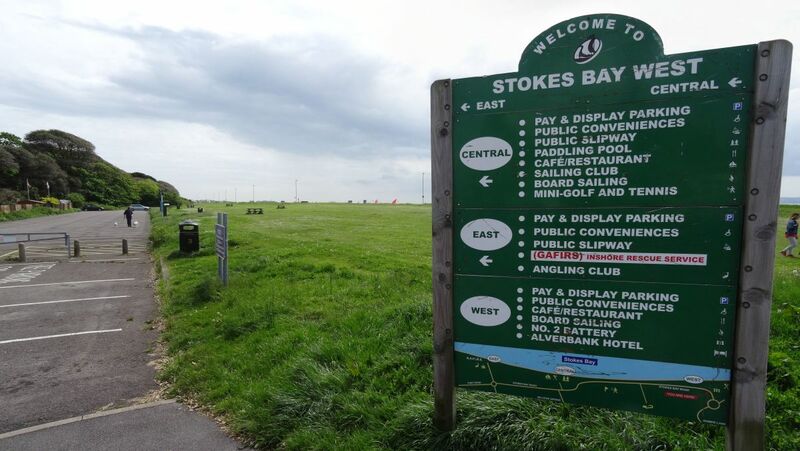 The Friends of Stokes Bay hope to persuade Gosport Council to provided more. There are two large shelters along the promenade at the east end of the Bay where you can sit and enjoy the views out of the wind. These are actively maintained by The Friends of Stokes Bay in conjunction with Gosport Borough Council. 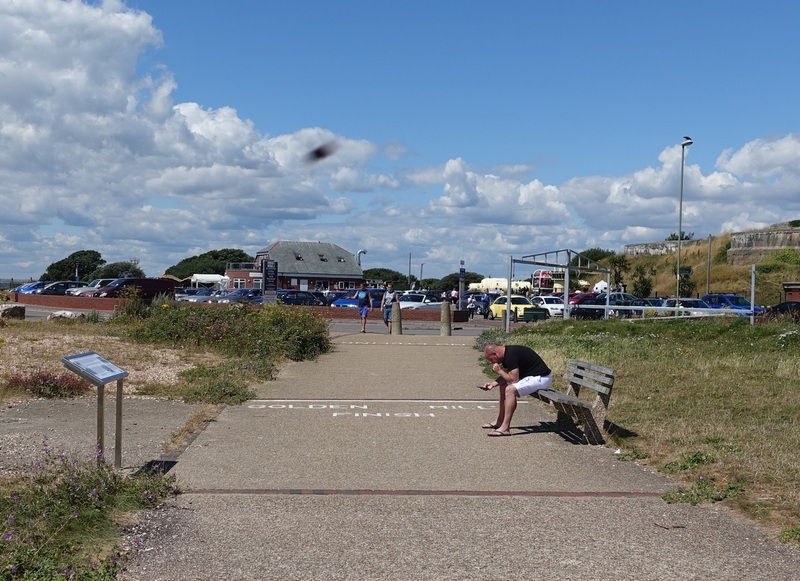 In addition there are many benches along the promenade mostly donated by Gosport residents in commemoration of family members. There are 30 beach huts for rent at Stokes Bay, in two blocks at the east end of the promenade. 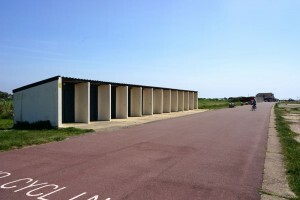 There are two rows of concrete beach huts on the east section of promenade at Stokes Bay, close to the GAFIRS headquarters. These are owned and administered by Gosport Borough Council. To be eligible to rent a hut you must be resident in Gosport or Lee-On-The-Solent (proof to be provided). Huts are rented on a three year term and re-entry on the waiting lists, for both Stokes bay and Lee on the Solent, can be requested after this period. Rents are charged annually on the anniversary of the date of occupation. Charges are £830 per annum, £630 per annum for senior citizens and £530 per annum for disabled persons (proof to be provided and the disabled person must be named on the tenancy). 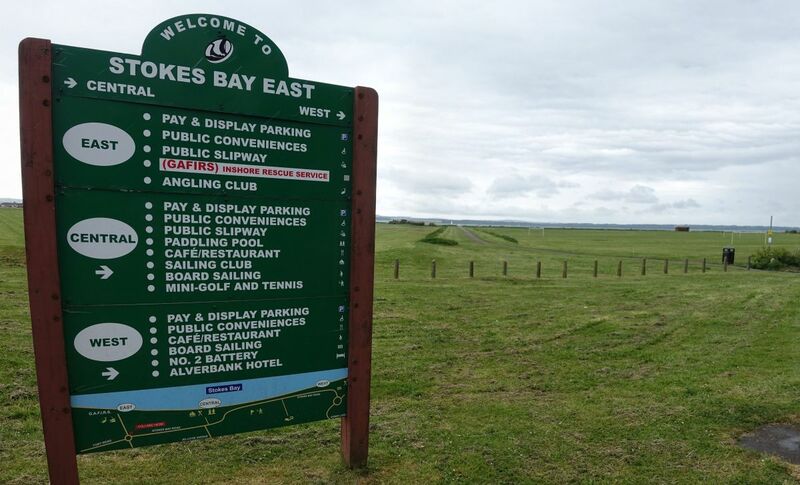 Disabled residents are able to hire a hut at Stokes Bay from late spring bank holiday in May to August bank holiday at a cost of £18.00 per week. A refundable security key deposit of £5 is required. At present the waiting list for a beach hut at Stokes Bay is around ten years. 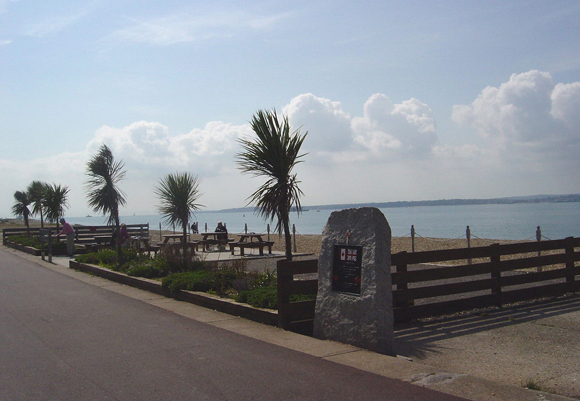 You will find the start of the Golden Mile run on the promenade at Stokes Bay just past the GAFIRS slipway. 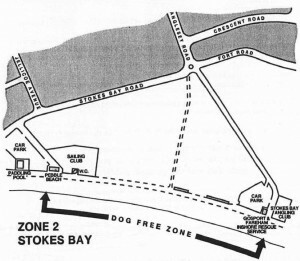 The end of the Golden Mile run can be found at the western end of the Bay just before the promenade ends at No.2 Battery. This event takes place once a year in June. In 2016 this will be on 19th June. Of course you can run the Golden Mile on your own, or with friends, at any time just for the fun of it. The race is managed by Nice Work on behalf of Absolute Running. Stokes Bay Dog Free beach areas. 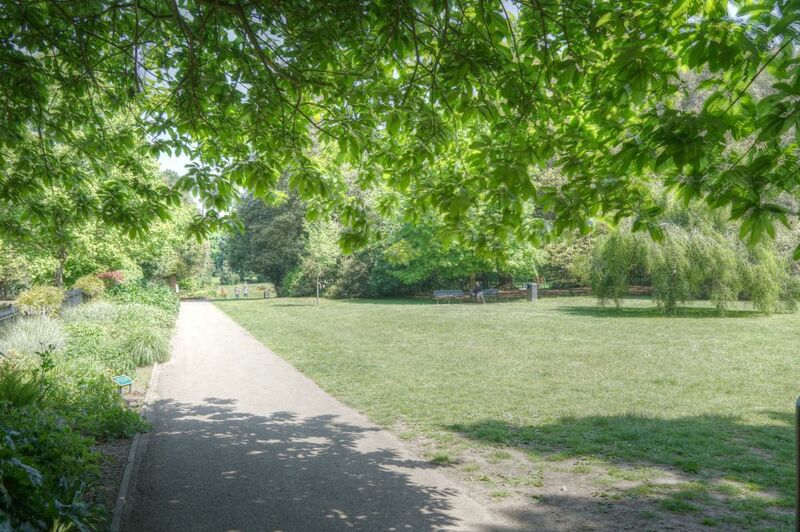 Dogs are not allowed in signed controlled areas between 1st May – 30th September. 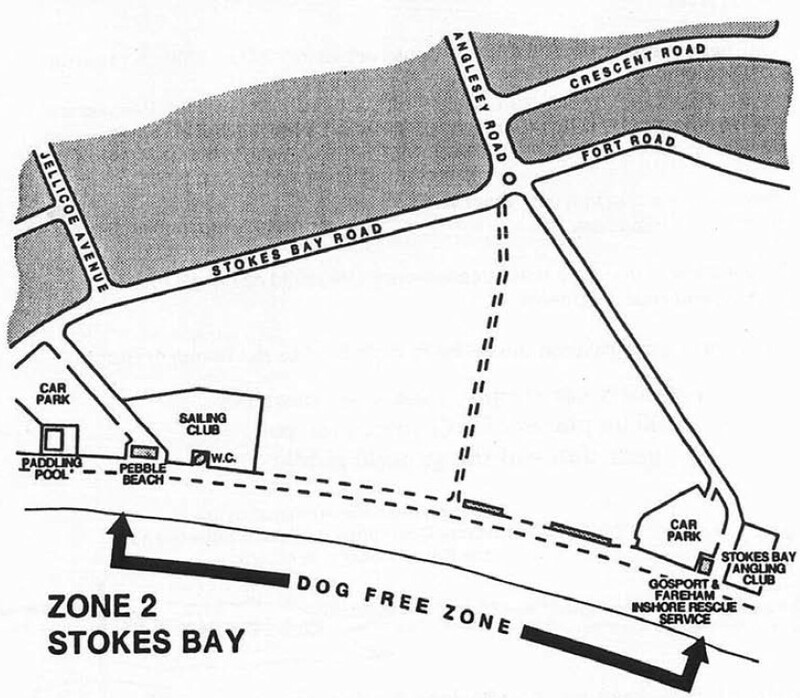 The Dog Free beach area extends from Pebble Beach to GAFIRS. There are ample dog bins along the promenade for responsible owners to deposit their dog waste. 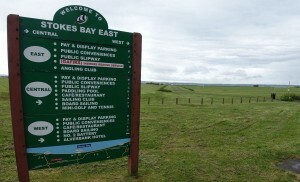 Dog walkers and their dogs enjoy the open areas at the east end of the Bay towards Gilkicker. A Public Space Protection Order for the control of dogs in Gosport came into force on 1st May 2017. The order as made can be viewed here. Gilkicker has special interest for bird watchers, being a feeding station for many migrating birds in spring and autumn. 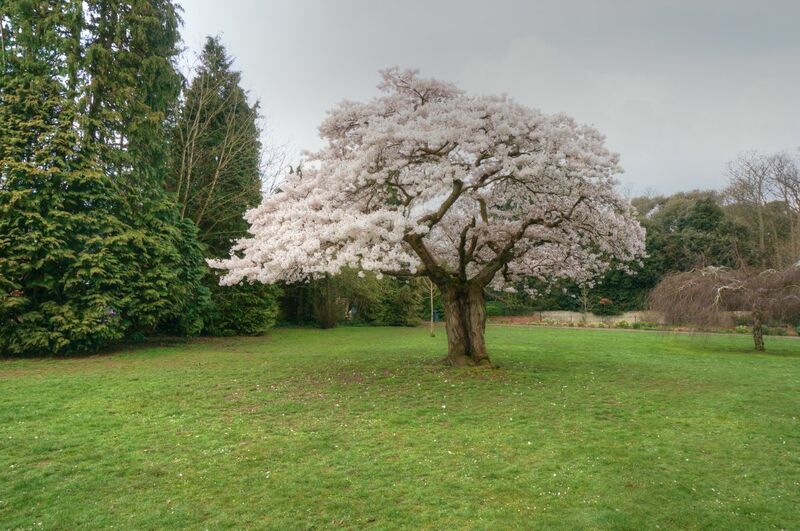 This beautiful tree in Stanley Park blossoms in early spring. 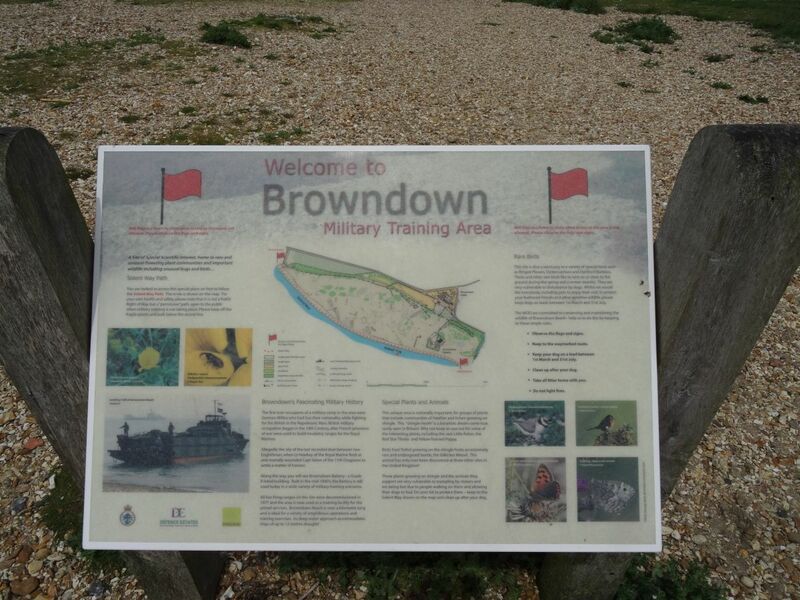 At the extreme western end of Stokes Bay is an area of coastline that has for many years been used by the Military for training purposes. It started life as a camping ground but was also used as a rifle and small arms firing range. Its large shingle mounds (butts) can be seen at the ends of each of the firing ranges and among the shingle you may also find remains of the old targets and the railway that served them.